XAML markup language is one of advanced features in EventIDE. XAML allows creating and editing vector graphics and interactive GUI layouts, both in the stimulus and status screen. Structurally, the XAML language resembles HTML providing a rich collection of tags, called elements. However, memorizing all XAML elements and their properties is not an easy task for a new user. 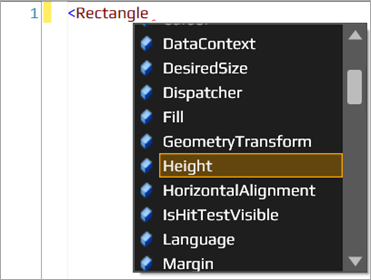 Fortunately, we have recently added the Intellisense code completion for XAML in the EventIDE code editor. This post shows how to use the XAML completion feature. 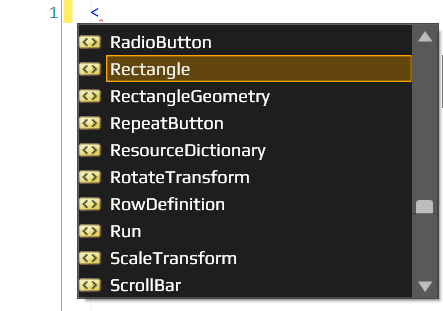 A list of properties belonging to the Rectangle element appears such that you can select one of element’s properties that you want to customize with a new value. Select a variable for binding and press Enter. The Slider gets bound to your variable, which will be adjusted, as the slider moves. The code completion feature reduces keyboard input and the amount of name memorization needed for XAML. You can use it in learning, exploring the powers of the XAML language. We plan to improve this feature further by adding dynamic documentation on XAML elements and their properties.